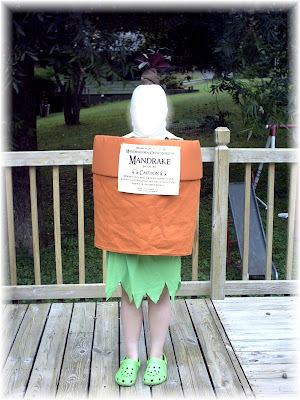 K found her Mandrake costume in the closet on Sunday. She can still fit in the pot, but, she can't slide down inside and hide anymore. At least not without a bit of a struggle. She's had such fun with this costume. 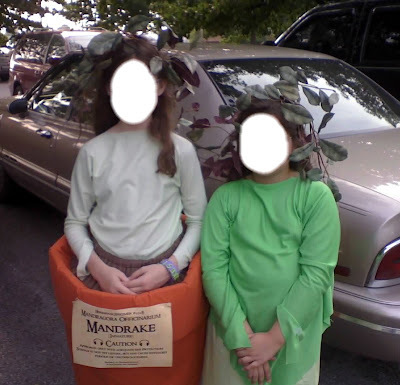 She and her friend V attended a Deathly Hallows release party last year at the library dressed as Mandrakes. They spent the whole time sneaking in and out of their pot. I guess that means they are ready for dicing and stewing. Which now I think about it, is about the best description of puberty I have ever heard. well just be sure to don your earmuffs when you transplat her. i wouldnt want you to go unconcious! Little girls, like mandrakes, squee for all occasions. We watched Order of the Phoenix this weekend. Mr. Man and I are now completely deaf. 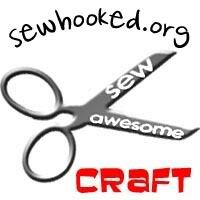 Just love your crafty lil' blog! When I found this post I just melted, saying "Awwwww!" Hope the transplanting process was successful and you didn't need to dice-n-stew after all. The jury is still out on the dice-n-stew. I once read that if you can live with your child when they are 2 or 3, then you will survive them when they are teenagers. I think I have a pretty good shot at surving K. I'll let you know in about 5 years. Just checked out your blog and your little ghost is adorable! I would love to see your little mandrake and will definitely drop you a line.